Sometimes the most simplest ingredients make for the best tasting dishes and this is one of those recipes. 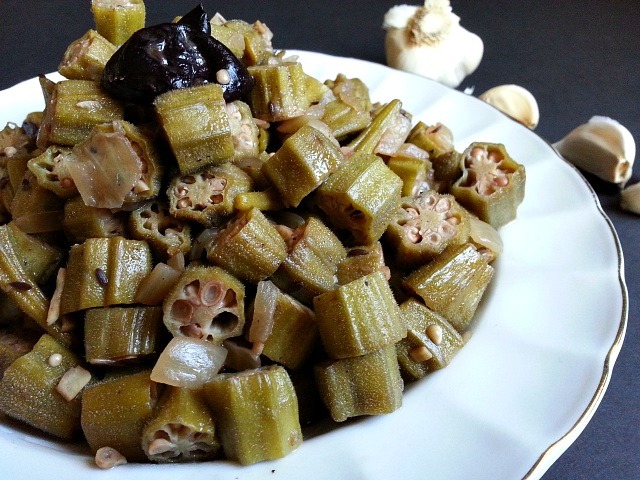 My husband and me love this old goan recipe of ladyfingers(Okra, Bhindi) that he willingly makes the trip once’s a week to the Indian stores to buy okra along with Chinese long beans. It is simple vegetarian clean eats unlike Fried Okra 😉 . Wash the okra and cut and line it on a cookie sheet to dry about 2 hours. While cooking mix the okra with the spices gently and then cook on lower medium heat just checking it and not over sauteing or stirring. Heat oil in a pot saute onions, jalapeno and cumin till the onions are soft. Next saute the garlic. Once done add the kokum, water, salt and cover and simmer the liquid. Next add the cut okra mix gently, cover and cook for 20 minutes check in-between and just stir once or twice. You can also add fresh grated coconut 5 minutes before you take it off the heat. Perfect as a side and tastes even better the next day as the okra absorbs all the flavors. As a Goan I know okra is used in 2 goan dishes. The other is the famous Ladyfinger and Prawn(shrimps)Curry. You can also check my version of the popular Indian restaurant Tava Bhindi Masala Fry or Spiced Sauteed Okra recipe here. Thank You so much :-). Regards. Yum!! 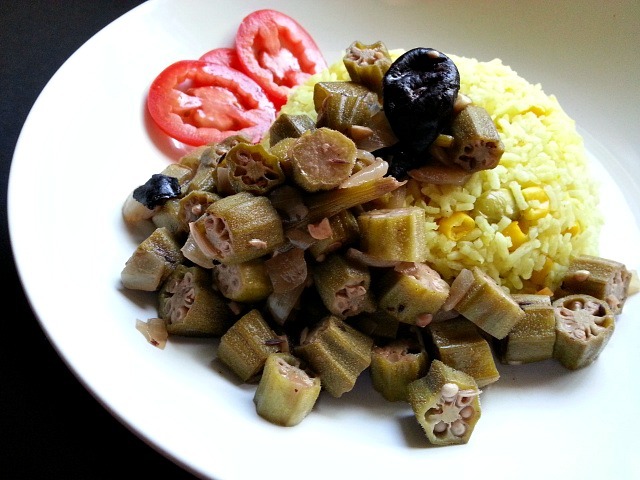 Love okra!! Slimy or not! Thank you for liking my blog post on a gluten free pie recipe. I see you have a good blog here. I must come to read more. Aha so thats how you stop it being slimy! I love it when I order it in a restaurant but hadn’t figure it out at home! I will have to try hunting some down, it’s not easy to find here. I love okra fried or sautéed.Thank you for the recipe. My mom makes something like this, but never shares the recipe. Now I have one! I love making okra too! I put it in a tomato-ey shrimp gumbo stew! This looks delicious! I grew up eating fried okra on visits to my Texas relatives. I’ll have to try it this way. This looks good. It reminds me of the southern okra and tomatoes dish I grew up with. Thank you so much Marie 🙂 . Wow! 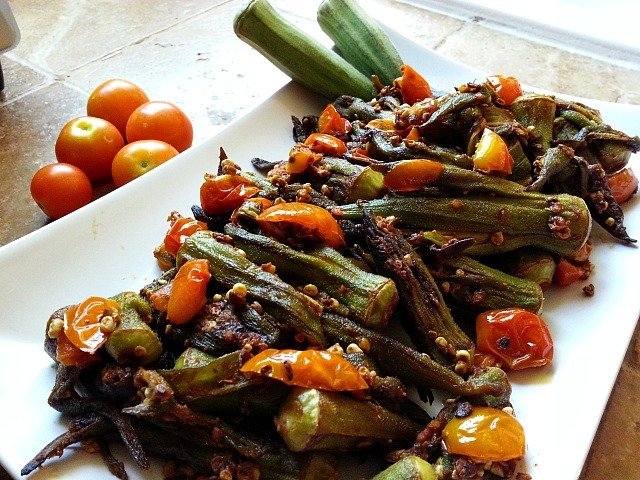 A new way to cook okra instead of the old Southern standby, okra and tomatoes. Thanks. Thank You! Yes it is but it works out perfect 🙂 . Thank You Jalal for the kind note. I am so happy to know you guys enjoyed it. Please pass on my appreciation to your wife. Will Do.Have a wonderful week. Ohhh…I know it is hard to find. We have it only in Asian markets where I live and it is expensive here as well. Reading your comment I think I should grow my own but since we are in a severe drought we have water restrictions. Glad to hear it’s not just me – I assumed it grows in abundance and is available cheaply elsewhere – but sounds like it’s like the gold of the vegetable world! I guess it is Laura 🙂 . Take Care. Thank You so much Peter for the re-blog. That is very kind. Thanks you not only for the liking my post but also for all the appetising recipes. I will tell my partner (my pommiepalwordpress) to look in on your blog. She is more into cooking than I am, I am into the eating. Love ladyfingers and your recipes look fantastic. Are those sour things the same as what they use in amotik? Another Goan delicacy? :). I love reading Stan the Man’s comments on your posts :). He definitely knows his Goan dishes :))Have a great weekend Nandini. Great idea for okra! We grow a ton of that in the summer here in Texas. Always looking for a new recipe. I did not know that OKRA was another name for LADY FINGERS, Here in the UK the Pakistan community call it that. I recall Me mum would make a red curry with Goan prawns and lady fingers. She used to call them BANDE. There is this place called St.Steven in Ilhas, Goa, where they grow landy fingers. Apparently, the lady fingers they grow here are the best in Goa. The people from the Island ST.STEVEN are called BANDERKARS. Anyway, Your dish looks amazing. Again My spouse likes lady fingers. So She will certainly give it a go. Will let You know, when We give it go. Have a wonderful weekend and a brilliant week ahead. Thank You Mr Stan. Yes they call it Okra out here and eggplant for brinjal. The bande and prawn curry is still very famous in Goa. St Estevam is a beautiful island. My dad was from there. That is so good to know that Mrs Stan likes ladyfingers. Yes, please let me know when ever she makes it. You and Mrs Stan too have a great weekend. It didn’t last long. I was on and off for several years. The only good thing about raw food is that you stay thin without trying. I really don’t think it’s the healthiest lifestyle. It’s great to eat a lot of raw foods, but mixed with healthy cooked is ideal. “Looking thin” would be my only motivation If I ever do it Maryanne. You are very much right. We need to follow a healthier food pattern for our overall fitness. I love okra very much whether its fried or with okra and meat and curry or with a slit in the middle filled in with cumin seeds, salt, powder coriander and deep fried. 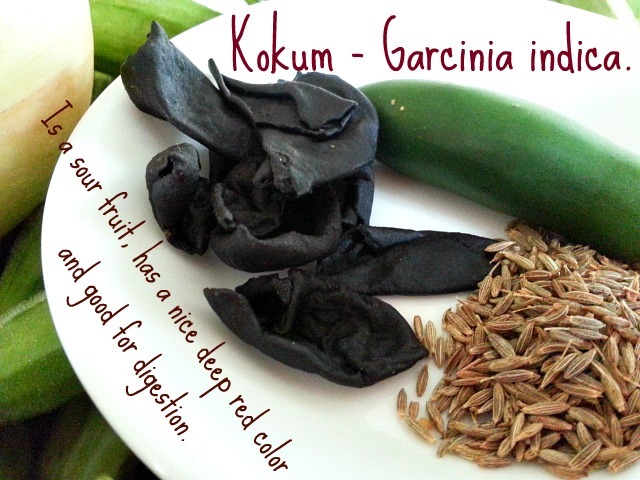 what is KOKUM? That is so good to know Tanveer. And thanks for sharing your recipe:-). Kokum is similar to tamarind mostly used in Goa and Maharashtra. To be honest, the best part of the dish you pictured seems to be the rice. I’ve not had good experiences with okra. Slimy is the best description I can render. Hope everyone else will try it and give a good review here. Then, I might try it. Thank You Connie. I can totally understand. I am hoping as well. You have to wash the okra and dry it individually rubbing with a clean towel to get rid of the “lace”. This is how I have always seen it being done in Punjab. In stir-fried (bhuna) recipes we add a sprinkling of besan to crisp up the okra. 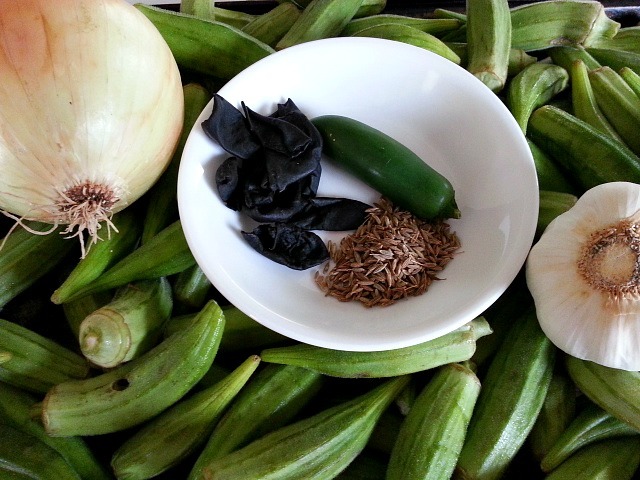 Also add the okra to the onion-based masala, but do not add water at any point. Keep it cooking over low heat without stirring too much, then let it steam covered. You will get bhindi withour the “lace”. It’s a delicious vegetable, don’t give up on it!